Posted on December 2, 2010 by Jill B. The prices of flash memory and DRAM chips have taken quite a plunge this year and the coming months should maintain lower prices, according to the DRAMeXchange. This kind of market trend is likely to benefit consumers, especially in the first half of 2011. For NAND flash memory, a predicted 35 percent price decrease for 2011 will bring 16 percent revenue growth to the industry at more than $20 billion. As far as NAND flash, smartphones and tablet computers are primarily responsible for the technology’s boost in demand. Smaller NAND chips at 20nm and 30nm that pack a greater capacity will essentially grow the supply by almost 80 percent. Consumers will potentially see bigger and better flash drives that may have once been out of their budget now become more affordable. 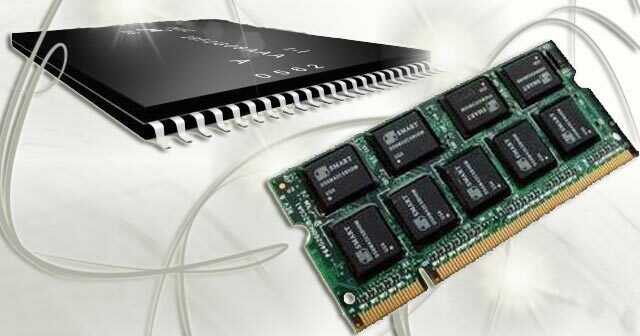 As for DRAM, the market price is set to decrease by 40 percent for 1GB DDR3 chips and by 30 percent for 2GB DDR3 chips. Over a two month period between September and November of this year, contract DRAM prices went from $1.91 to $1.22. The sharp fall occurred due to the fact that more chip manufacturers are producing more memory and in turn demand has dwindled slightly. According to an article in PC World, consumers won’t necessarily see the price drop of DRAM reflected in their purchases, which is a more typical market reaction. Instead, computer vendors will offer higher quality specs in order for vendors to preserve a certain price point. Your wallet may not see a difference, but when you go to use your system, you will notice improved functionality. While DRAM and NAND are separate technologies, the combination of their market forecasts is good news. Better, more capable computer systems will be available thanks to decreased DRAM prices while more affordable USB devices will be released to work with those systems due to the NAND flash market. It appears a win-win situation for the consumer. The best time to buy may be in the first half of 2011 with the influx of shipments and before DRAM manufacturers could cut back on production to allow prices to recover. What do you make of the NAND and DRAM prices? Do you think it could indirectly mean a rise in USB 3.0 devices? This entry was posted in Articles, USB Technology and tagged DRAM chip prices fall, DRAM Chips, DRAMeXchange, NAND chips, NAND Flash, NAND flash memory, NAND Flash price falls, USB devices. Bookmark the permalink.